Itinerary - ROGER KERSHAW CUSTOM TRAVEL INC. Shore Excursions / Yacht Land Adventures now available! ​La Perla del Sur, or “Pearl of the South, this southern city was first populated by indigenous peoples and later settled by French immigrants in the 1800’s. The port, very large by the standards of the times, was instrumental in multi-national trade, especially between South America and Jamaica. Sugar was a major export of the city. The city’s Urban Historic Center is a UNESCO World-Heritage Site, serving as an example of urban planning accomplished during the 19th century by the Spanish. Other attractions include Castillo de Nuestra Senora (a castle/fort), historic cathedrals, botanical gardens, a cigar factory, and the University of Cienfuegos. An intimate resort island in Cuba also known as Cayo Largo del Sur (“Long Cay”). Being the largest of 300 island in the Canarreos Archipelago, the cay runs close to 25 kilometers (16 miles) long and 3 kilometers (1.9 miles) wide. With a zero-permanent population, the island beaches of Playo Sirena and Playo Paraiso are kept in pristine beauty and offers the finest undeveloped beaches in the world ready for enjoyment. The possibilities are limitless here is Cayo Largo. 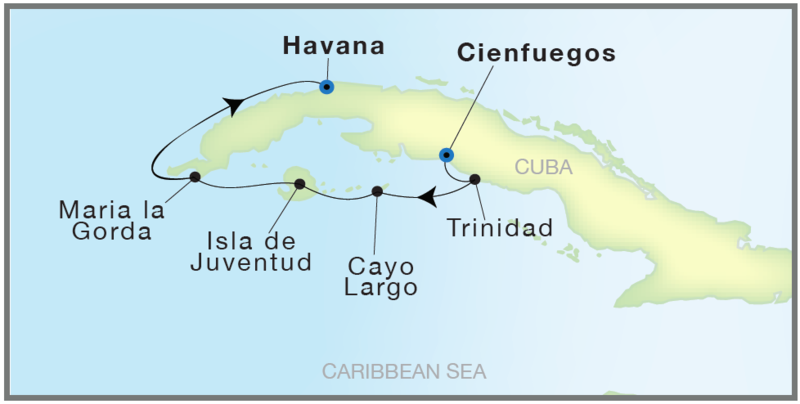 Known as the “Isle of Youth” and the “Isle of Treasure”, is the second largest island off Cuba. Very popular with divers and “treasure hunters”, this island is known for its beauty and pirate stories and history. It’s home to Punta Frances Marine National Park which is great for diving the beautiful coral; it’s idyllic and unspoiled. You’ll also enjoy beautiful black-sand beaches with crystal clear aqua water. This island also features a historic prison turned museum where Fidel Castro was himself imprisoned at one time. Maria la Gorda, part of the Western Cuban province of Pinar del Rio, is a scuba diver’s dream and another yachting port where bigger ships cannot follow. The port is full of lush natural landscapes, native birds and animals, and the sea life is simply spectacular. The shimmering, aqua colored waters welcome experienced and beginner divers and snorkelers. Authentic Cuban Mojitos and fresh seafood are served by locals right on the beach. Experiencing this Island’s sunset should definitely be at the top of your “to do” list. 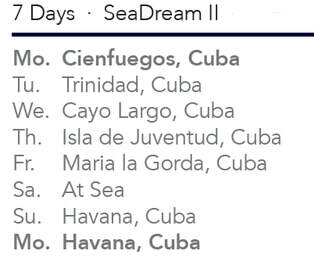 Your chance to really appreciate the luxury that is SeaDream - and why we say, "It's Yachting, not Cruising". SeaDream’s award-winning 5-star service is second to none. Relax. With only a maximum of 112 pampered guests and an award-winning crew of 95, the crew to guest ratio provides each guest with SeaDream’s incomparable style and attention to detail. Dine. All gourmet meals are included in your voyage fare, and are prepared a la minute with only the freshest of ingredients. Spa. A rejuvenating experience awaits you at the SeaDream Spa. Discover the ultimate in Thai therapies and behold the secrets and luxury of their time honored spa treatments. All our booked guests receive a USD200 on-board spa credit per stateroom!